Herding and Protection Sports – Can My Dog Do Both? First, you have to look at your goals in each sport. Both sports are very time, labor and $$ intensive. So if your goal is an HC (Herding Champion) or a protection sport at the higher levels (national level IPOIII/MRIII/FRIII), you're probably best picking one or the other. Especially when there is minimal overlap in terms of skill sets. It's not like adding some obedience titles while working on the protection sport titles. Or adding Mondio titles while working on the FRIII. I'm also going to assume I don't need to mention that to do both, even at the lower levels, you need a dog that actually has the talent neccessary in each venue. 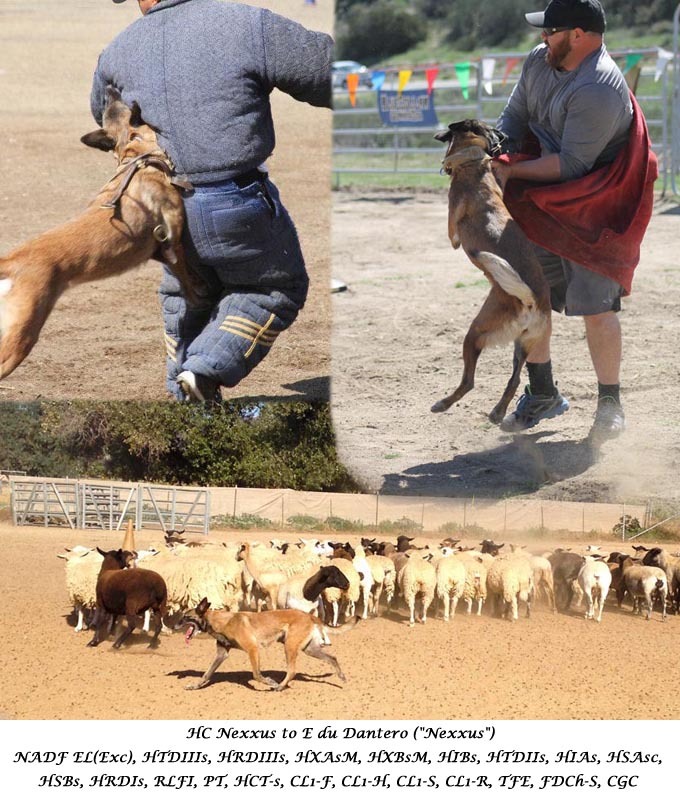 The main issue people seem to worry about when considering doing both, is that the bite drive built and utilized for protection sports will result in dogs that want to do nothing but chase and kill sheep. This isn't just a concern the dog owners bring up, but also other people that train with them, stock and facility owners, etc. What they don't realize is that generally it's the opposite. Both herding and protection sports build drive, but they also teach the dogs control in a high level of drive. Watch a dog drive sheep through a long skinny chute, in close contact right on their heels, but without biting or loosing it's mind. Or watch a dog walk up straight into the face of livestock that’s challenging it, maintaining focus and pressure without using its teeth. That's control in drive. Watch a protection sport dog "out" (let go of the man) immediately on command, then guard close and intense, without taking any cheap shots. That's also control in drive. Both venues teach the dogs to respond immediately to commands while in a high state of drive, and sometimes high state of stress. They also encourage the dog to think independently while still being a team mate. Tracking in IPO, guard of object in Ringsport, working out of site in herding or taking the command the handler actually meant/needed, not the one they command LOL are all examples of times the dog must think independently to perform a job based on criteria previously set out by the handler. So where is the conflict? It's all about the stick and how the dog should react to pressure. In herding, the stick is used as a directional and on occasion correction tool. When first starting out, the stick is used as an extension of the handlers arm, to protect the livestock. Especially with a "young" dog, young being in either age, level of training, or both. Those dogs tend to want to chase, and bite what they are chasing. The stick is used to block them from harming the sheep, and if necessary administer a correction to stop them. Very quickly in herding the dog learns to give to the stick. If the handler moves the stick to the dogs left, it will move to its right. Hold the stick horizontally and move it towards the dog, they will slow down or back off. Etc. The dog also learns to understand the "bubble". The bubble, or flight zone, is a circle around livestock that if the dog enters will cause the animals to move. This bubble is never the same at any time and will vary according to the livestock, weather, individual dog, environment (open field, small arena, hills, vegetation, strange vs familiar area, etc), time of day, etc. Some dogs have a natural understanding of this bubble and how to react to it, others not so much. When working livestock, the goal is to move them along at a comfortable, controlled pace. The dog does this by working the edges of the bubble. They move up to the edge, and as the livestock begin to feel the pressure and move off, the dog stays at that level of pressure. Push too hard and the livestock might bolt. Don’t push enough and the livestock will stop moving or decide to just go in whatever direction they choose. Keep in mind though that the circle changes on a regular basis, so the dog really needs to understand where the pressure point is at any given time, and if they do push too hard how to remove the pressure by backing off, looking away, slowing down, etc. Even when moving into pressure, ie livestock that wants to stand and fight, the dog should only continue to move into the pressure for as long as the livestock refuses to "give". The minute the livestock says "OK OK, I'm moving" the dog should stop building pressure. A bite should only happen if the livestock refuses to give, or actively tries to fight the dog. Now let’s look at protection sports. The response we want from the dog towards the stick in bitework, depending on sport and training style, is to either be neutral to it, or for it to be a drive builder. Meaning the dog should take stick hits without reacting to them, or by coming up in drive and fighting even harder. What they should not do is move away from the stick or considering a correction. Some people do use sticks in training as guidance or correction tools, such as a tap stick in heeling, a bar in the change of positions, etc. but these tools are generally not introduced until the dog has a fairly solid level of training and their foundation work in bitework has been done. We want the same forward response to pressure in bitework. When the dog feels pressured or threatened, we want the drive to go higher, and the dog to go forward and into the pressure with everything they have. If the decoy begins to "give" to the dog, the dog shouldn't back off on the pressure but continue to drive forward even stronger, and dominate the decoy even more. This power, fight and dominance should continue, regardless of how hard the decoy fights back, how passive they become, if they attempt to flee, etc until the dog is told by the handler to stop, and not before. So Can I do Both? Below is a list of dogs I've put both herding and protection sport titles on (in bold), but you'll notice the higher the titles in one venue, the lower in the other. Not due to lack of talent, but lack of time and other resources. 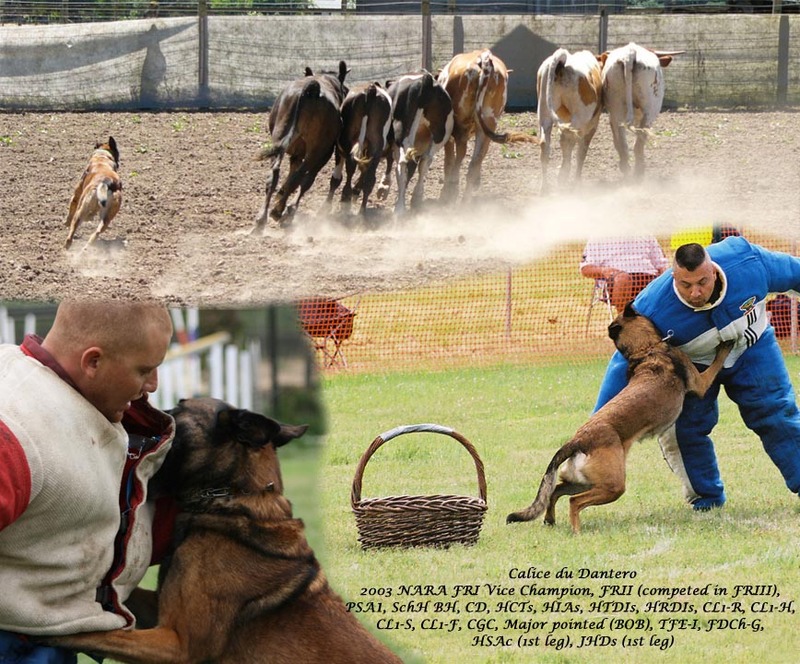 Some quick links to dogs doing both herding and protection sports. For more videos go to the videos page. Great article, thank you for writing it and sharing. I think your point about the stick is very important and applies elsewhere as well. I notice people training obedience with a lot of giving to pressure and compliance and then having weak dogs that they wash out. They never realize that it was their obedience training and general handling that made the dog weak in protection.